On Monday, the Select Committee on School Finance Recalibration is holding its first meeting. It is in Casper at 10AM. Click here for the official announcement. This is an important meeting that deserves attention from every Wyoming taxpayer. This is, namely, the committee that is going to find new taxes, and raise existing taxes, to prevent cuts to school funding as far as ever possible. before and during the legislative session that just ended, official statements from the legislative leadership suggested that the education-funding deficit could reach $1 billion by 2022. I do not believe this is a good forecast - on the contrary, it is exaggerated and has a slight taste of scare tactics to it. A more realistic forecast is that without proper reforms, our structural budget deficit will stabilize around $700-750 million per year from 2020 and on. That is bad enough, and I would rather talk about the proper reforms than, in this context, the relatively unimportant difference between $750 million and $1 billion. Again: let us not under-estimate the consequences of raising taxes to close the budget deficit. If our legislature tried to raise taxes to close half of what they predict the deficit to be, it would cost a family of four an extra $4,000 per year. To be blunt: with its committee on school finance "recalibration" (re-taxation would be a more appropriate term) the legislature has put our state's economic future in grave danger. It would have been a much better idea to begin with a committee on school-choice reform that could rely on parental choice and educational freedom to bring down costs without jeopardizing educational quality. But even before we get to school-choice reform, there is something we could do right here, right now to start cutting the excessive cost of education in our state. In 2014, the latest year for which the Census publishes solid numbers, Wyoming used 16.3 percent of all its school spending on capital outlays. The $288 million, out of a total of $1.76 billion, was more than twice as large a share as in the country as a whole. Put differently: for every $1,000 we spent on school operations, we spent $196 on capital construction. 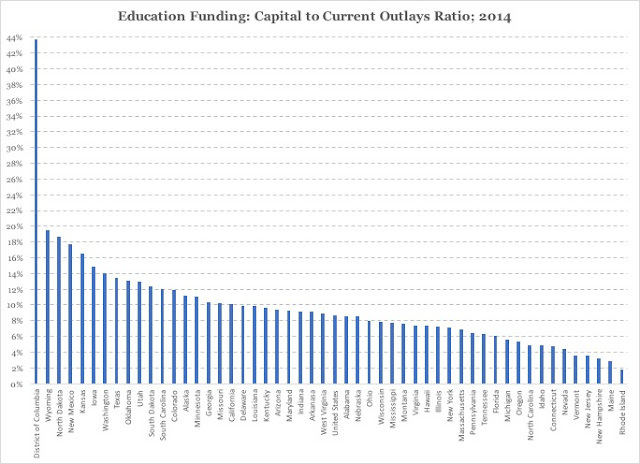 In the rest of the country they spent $87 on capital outlays for every $1,000 in school-operations costs. The savings emerging from this adjustment are not nearly enough to eliminate the structural deficit in the state budget. However, scaling back on the construction of educational shrines around the state would be a good start on adjusting state spending to a permanently smaller tax base. With a more localized funding model, we allow school districts more authority to tailor their schools and their educational offerings to local needs. It is also a first step toward opening up our K-12 school system to tax-funded vouchers, school choice and educational freedom. An often-heard argument against decentralized school funding is that the educational opportunities in poor counties will fall behind those of wealthier counties. This is, however, a dangerous argument to make: its logical consequence is to nationalize the entire education system. Who would want the Arne Duncans and Hillary Clintons of this world to micro-manage your child's education? If we can scale back school construction spending to the national average; if we can localize more, ideally all, of our school spending; then we have taken the very first steps toward a better education system here in Wyoming. Those steps would only be the first - the end goal is complete educational freedom - but they would constitute the beginning of a process that combines educational quality and freedom with fiscal sanity. The last point is not to be ignored. If we stick to the current legislative plan, namely to "recalibrate" school funding, we will end up with massive tax increases. That, in turn, would be a death blow to our state's economy. *) All data reported in this article is from the Census Bureau's education funding database.